Well, major health scare declared over. I've been feeling better, but I haven't been as gung ho about writing about beer as in the past. The whole experience has had me thinking differently about beer. I'm more interested in just taking a few notes about a particular beer or just plain enjoying it than trying to imitate some kind of beer "journalist" or writer by updating my blog at least once a week. I've found that writing can sort of take the fun out of having a beer; it can sort of get in way of the experience and make it less natural. That said, here I am in front of the computer screen with an interesting beer and I feel compelled to say something about it or at least record my observations. I popped open a can of the Little Yella Pils last night upon returning home. It was quite tasty and seemed a bit more refined than some other American-made pilsners. It had just right amount of bitterness combined with a smooth malt character and firmness with just the right amount of dryness in the finish -- a very good uncomplicated beer. Tonight is something altogether different, I'm sipping what spurred me to write. I'm having one of the New Glarus bottles and it is the opposite of the Yella Pils: it is complex and sour. The Imperial Saison is orange colored and has a sour aroma; sort of like rotting peaches with a bit of vanilla and then something not so good. Cat pee. Just a hint of it mind you, but enough to put the beer aside for a bit and sort of let it air out. This beer tastes pretty much like no other saison I've had before; there are bright sour flavors that don't typically make their way into a traditional saison -- but who says American brewers follow tradition? There are some good fruit flavors here, with apricot and apple but the sourness permeates and somehow doesn't add to the experience, but detracts from it. Perhaps it's the cidery character that sneaks up on me after a few sips that's a turn off -- I'm not sure -- maybe I'm just not in the mood for a sour beer. Unfortunately, this beer doesn't get any points for its appearance, as it is hazy and appears flat with no head. I think I'll give the remaining bottles some months or years in the cellar and see what happens. The results could be interesting, but as this point I'm less than excited about this one. Anyone beg to disagree? I've enjoyed a lot of beer over the last 20 or so years. Too much, in fact, but so far I don't regret it a bit. I'm hoping I don't. That said, I think it is time for a change. In short, I think being a part of the beer culture as I've known it (likely too much of it) has taken a toll on my health. So, I think it's time to stop pretending to be keeping up with the younger, healthier people that are far better at abusing their hearts and livers with beer than I am. Yes, with each day lately it seems that I'm stepping ever closer to ceasing to be the "beer guy" in favor of someday being the old man who can slowly sip that beer with dinner and maybe one for dessert. So it is indeed possible that the last batch of Marcobrau may have been brewed. I certainly don't see myself as drinking and brewing enough to keep a blog about it going. Maybe my anxiety is getting the best of me, but I think it's time to hang up my beer blogging mug. I'm not sure at this point what I'll do with my website that I've had up since 1998, but I'm certainly not going to worry about it. Going forward, I just don't see myself as being "beery" interesting. This isn't quite how I planned things, but life rarely goes according to plan. At only 38 years old I'm looking forward to figuring out what's going on with my body, getting healthy and putting more time into some of my other hobbies such as music, cycling and hiking. There's a lot of summer left. I'm hopeful that I'll be able to continue to be active, in one way or another. I had the good fortune this past week to visit Short's Brewing Co. in Bellaire, Michigan. I've been pining to visit them ever since sampling their beers (Nicie Spicie, Chocolate Wheat and Huma-Lupa-Licious IPA) at the Real Ale Festival in Chicago several years ago. I've had some Short's since then; sampling Nicie Spicie in Holland at Butch's a couple summers ago, but traveling to the source and getting direct access to the dozens of beers Short's produces was so exciting that I think I had anxiety attack. The sheer breadth and diversity of Short's beers are amazing. Suffice to say we took home a six-pack of Bellaire Brown (possibly one of the best brown ales I've ever had) along with a limited edition bottle of Bloody Beer; a "specialty beer" fermented with Roma tomatoes and spiced with tellicherry peppercorns, celery seed, fresh horseradish and dill. I'm really looking forward to trying it; I imagine something like the marriage of a Bloody Mary and a good all-malt beer. A fellow patron at the bar described as awesome. Some of the other far-out limited edition creations we could choose from included Peaches and Creme (a strong blonde ale brewed with peaches and lactose, Ginger in the Rye (a strong rye ale aged on ginger and The Woodmaster (a strong brown ale fermented with maple syrup and toasted pecans.) 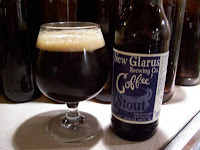 Pretty interesting concoctions and based on reviews at Beer Advocate the extreme beers of Short's are gaining notoriety. This, of course, is not to say that the regular offerings of Short's are not worthy; they are in fact quite good. I still love Nicie Spicie which the brewer describes as a "Northern Michigan spiced wheat ale" made with "a 50 percent mixture of premium two-row malted barley and malted white wheat ... loaded with fresh citrus zest, coriander, and a four pepper blend." 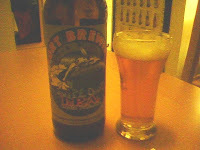 The beer ends up in the glass with a citrus (orange) nose, a refreshing wheat middle and a peppery (but not hot) finish. I also appreciated the Pandemonium Pale Ale for having an excellent hoppiness without being as strong as an IPA (less then five percent alcohol), while the Bellaire Brown, which the brewer describes as a "gateway beer" is really an outstanding complex brown ale that any level of beer drinker should appreciate. The toasted, caramel and chocolate flavors of this brown ale blend exceptionally well with the hops and yeast. The brewpub itself is pretty interesting, too. 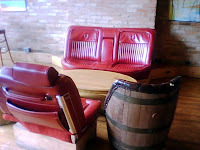 It's in an old brick building in Northern Michigan and is full of local art work (mostly paintings) and interesting places to sit -- such as the red seats out of a 1970s Cadillac automobile. The brewpub is separated into two sections: there is a bar area and a music room with perhaps the deepest, narrowest stage I've ever seen. The beer is served in pints and samplers (a paddle) of five beers. In our case we ordered two five-beer samplers so we had 10 different beers to sample. Six-packs and limited edition bottles are available for sale and growlers are filled, too. The food is great, as well, especially the spicy Thai Carrot Soup which my wife thought was the best soup ever. (I concur that it was pretty damn good.) Other food including sandwiches and pizza is available along with unique snacks such as Briess Malted Milk Balls -- which I really wish I would have tried and probably would have paired well with the Bellaire Brown Ale. 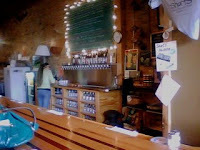 Short's Brewing Co. is not too far from Traverse City and in the middle of an awesome Chain-of-Lakes district. It's off the beaten path, but well worth the visit. 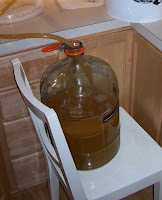 Racked a saison-style ale that I brewed last Sunday. I received a Williams Brewing catalog and got curious about a new Belgian Pale liquid extract that is 90 percent pilsner malt and 10 percent wheat, which seems ideal for brewing a saison. I kept it really simple because I haven't used this extract before (it's new on the market), so I just added three additions of Spalter pellet hops and a little cracked black pepper at the end of the boil. The liquid that filled the glass carboy that is my secondary fermenter was like a yeast smoothie, but based on my sample it's tasty one. I poured my hydrometer sample into a tulip glass. The beer smelled a bit peppery and quite earthy-yeasty with a bit of lemongrass even though I didn't add any. It tasted very crisp and cracker-like, especially towards the finish with lots of pepper followed by juicy citrus and phenols accented by a floral, spicy character. The hydrometer reading, by the way, showed about 74 percent attenuation. I'm fairly confident this yeast (Wyeast 3724) will keep working, albeit slowly, for a couple more weeks. And, if by chance I don't get the attenuation I'm looking for, I have another yeast (Safale T-58) that I can pitch. I've used the T-58 before with decent results, but I'd to stick with supposed "Dupont" strain if I can. I've posted a Promash recipe report for this recipe here. Finally, a new microbrewery in Chicago that is crafting a portfolio of lagers. I've waited several years for this moment. I'm old enough to remember drinking lagers from two Chicago craft brewers: Chicago Brewing Company and Pavichevich Brewing Company. These two breweries produced two of my favorite lagers back in the early to mid-1990s. 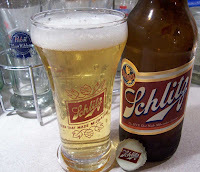 Chicago Brewing produced Legacy Lager and Pavichevich made Baderbrau. Legacy Lager was good, but I remember really enjoying Baderbrau. I miss that beer. Fast forward several years and Doug and Tracy Hurst open Metropolitan Brewing Company at Ravenswood and Winona on Chicago's north side. They're seeking to bring "a little balance to the party" that is the American craft beer movement by brewing German-style lagers. Their portfolio includes two beers so far, Flywheel Bright Lager and Dynamo Copper Lager. 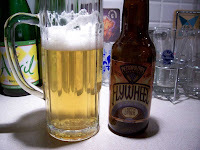 I sampled the Flywheel Lager at Lunar Brewing Company a few weeks ago and I had mixed feelings about it, mostly because I wanted it to be Baderbrau, my all-time favorite Chicago lager beer. But this wasn't fair -- I'm pretty sure the creators of Flywheel were thinking of Germany and not the Czech lagers that inspired Ken Pavichevich to brew Baderbrau. I think there is a difference between German and Czech lagers; it might not be as great a difference as English and American-style IPA, but I think there is a difference. So I started thinking of German lagers when I opened my bottle of Flywheel tonight and I got it. I liked it more the second time around out of the bottle. The Metropolitan beers might be a bit pricey at $10 a six-pack for local lager beer, but they're fresh -- brewed just a few miles away -- which counts for something. 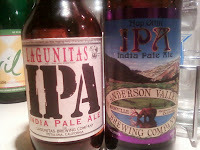 The details of my tastings of both Metro beers are on Beer Advocate. Enjoyed a Port Brewing Wipeout IPA this evening. I've been meaning to get to this beer for awhile now. 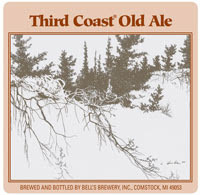 I remember being captivated by it the now defunct Real Ale Fest in Chicago several years ago. Lots of fruity hops in this orange-ish ale. Bits of grapefruit, mango, bitter orange in the aroma of this beer. You can taste of these hoppy qualities, too. The bitterness is potent, and balanced with just enough pale malts and no doubt some dextrin malt to keep the hops from making this beer unbearably bitter. No caramel malt or other malt flavors are noticeable. I've read about some carbonation problems with the beer, but I thought the carb was perfect. 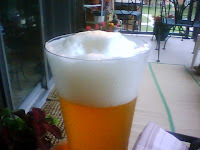 The beer poured with plenty of carbonation and a fairly persistent head. Overall, a very delicious IPA that I would definitely revisit and recommend. Phew...I'm tired. I got right to brewing after work today. My target is another simple English Bitter, hopefully improving slightly on the last, using the Wyeast 1469 West Yorkshire. This was a simple recipe: one can of Munton's Light, two pounds of Munton's Dry Malt Extract, 1 ounce of Amarillo hops for 60 minutes, a half-ounce for 30 minutes and a three-quarters of an ounce mix of Fuggle and Styrians steeped at the end of the boil. All the hops were pellets. Added Irish Moss for clarity at 15 minutes to the end of the boil. I experienced a minor boil over, but the bigger problem was when my wort chiller came apart. Fortunately, I was able to make repairs to the chiller. Cleaning up all the water on the floor wasn't too much fun, but at least none of the chiller water got into the wort. I've also forgotten to report that I brewed the Northern Brewer Barleywine back two weeks ago. I racked this batch into the secondary tonight so I could use the primary for the bitter. I didn't reuse the yeast because I figured I already used it once, it was tainted with a lot of hops. I pitched fresh Wyeast 1469 for the bitter. The barleywine tasted deliciously strong with a fair amount bit of a banana aroma -- some interesting esters for sure. I figure I'll let the barleywine sit in the secondary for at least a couple weeks before bottling. Changes to the bitter (compared to the last batch) included substituting Munton's light DME for the sugar and changing up the hop schedule; using some American hops for bittering instead of all English. It's amazing to me how homebrew gets tucked away and sort of forgotten. This is the case with a beer I brewed back in August 2006 that I initially referred to as the Kitty Kat beer. My inspiration for the batch was Jolly Pumpkin La Roja, but the recipe evolved into something a bit different, with a much more spiced (and different) flavor than the JP brew. This beer was brewed fairly strong at an estimated 7 to 8 percent alcohol. I used an odd combination of spices for the batch; cardamom, fenugreek and black pepper. The full recipe is available here as a Promash summary. Anyhow, I remember this beer having a really strong maple-like flavor from the fenugreek. Granted, I expected a maple-like flavor from this spice, but I seemed to miss the mark and added too much. It was almost undrinkable. It mellowed about a year after bottling to the point where this flavor wasn't as strong. Now, about two and a half years later, this beer has finally become more balanced and complex. The fenugreek is still present in the nose mixed with a bit of booziness/alcohol and a dusty cola-like aroma of cardamom. The fenugreek is still the dominant flavor up front, along with caramel, but then caramel malt flavors fade into a tamarind-like fruity-tartness, then back to sweet caramel flavor that evaporates into a dry finish with a latent hint of pancake syrup on the back of the tongue. Pretty weird, I know, but it's good in small doses and it works quite well with Indian food as fenugreek is a common spice used in that cuisine. 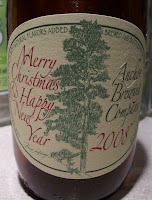 Anchor Our Special Ale is another one of my favorite Christmas/Holiday beers, but I never know what to make out of it. I suppose that's the idea. First off, this ale has a very pleasant aroma (it always does). Spruce comes to mind, along with cocoa and there's maybe a hint leather. A very interesting combination, for sure. Aside from the aroma, my first impression of this year's batch of Our Special Ale is that it's not the brewery's best vintage. The mouthfeel is decent, but body the seems a bit light. Also, the flavors aren't as bright as I'd like them to be: black tea-like flavors mixed with raisins, followed by a tamarind-like tartness. This tart character is probably the most interesting aspect of this ale, aside from the aroma. The tamarind flavor sort of builds in intensity with each sip, as this year's batch of Our Special Ale starts to grow on me. So is this beer a spiced porter? Maybe, but it would be dryish one. I would still stay it defies categorization. 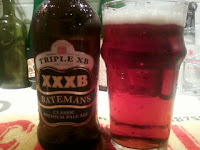 It is definitely an interesting ale, but I would suggest that newcomers try a single bottle or draft before committing to a six-pack. Last night I cracked open a "tester" bottle (half-liter swingtop) of my last batch of homebrew and I'm pretty pleased with how it carbonated in the last week or so. I'm a bit concerned with the level of bitterness; it's fantastic right now, but I'm wondering if it might fade with time. I guess this shouldn't really be a concern as this 20-pint batch will go rather quickly. The Wyeast West Yorkshire Ale yeast that I used seems to have worked out; it seems to have contributed some fruity esters while keeping the balance relatively full. I think the blend of toasted and crystal malts in this batch worked well, too, but I'm reserving final judgment until I tap the Party Pig of this beer. Here's the recipe, if anyone is interested. Naysayers will say that it can't be any good because I've used dry malt extract, but I think DME and specialty grains can make pretty tasty beer.